For B-3 nuts, the return of Gene Ludwig is the best thing to have happened since Melvin Rhyne resurfaced on a series of Criss Cross CDs more than a decade ago. Ludwig came up in a strong Pittsburgh scene in the early 1960s, which led to work with veterans like Sonny Stitt and up-and-comers like Pat Martino. His near miss came in the form of an Atlantic 45 that was unfortunately released the week of the Kennedy assassination. It’s been over a quarter-century since the release of Now’s The Time, his sole Muse LP. 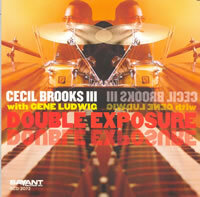 Kudos to drummer Cecil Brooks III for putting Ludwig in a heads up setting that really tests every aspect of his playing. Ludwig has it all: monster chops; mastery of the dramatic; a fully realized four-limb approach. The set is heavy on lounge repertoire, much of it taken at an almost maniacal tempo. He romps on “I Can’t Give You Anything But Love” and gallops through “On The Trail.” Despite the title referencing the late ‘70s meeting of Joe Chambers and Larry Young for Muse, the album has a decidedly mid-century feel, for which both Brooks the producer and the drummer deserve credit. This album, coming so soon after his appearance on the recent Jimmy Ponder album, What’s New (High Note), is reason to think that Gene Ludwig is at the start of a second wind. Imagine you have lost your main source of income, a bad shoulder prevents you from finding new work, and an earthquake has destroyed your home. In the face of all this, starting a record label devoted to improvised music would be, to put it mildly, counter intuitive. However, Italian percussionist Andrea Centazzo did just that in 1976, creating Ictus, “the creative label for creative music.” Within a half dozen years, Ictus became one of the bolder artist-operated labels in a halcyon era for such enterprises. Early Ictus LPs found Centazzo performing in Italy with established figures like Derek Bailey, Alvin Curran, Steve Lacy and Evan Parker. Centazzo also ventured to the US as early as ‘78, showing remarkable prescience by recording with a wide swath of emerging artists including Eugene Chadbourne, Rova Saxophone Quartet and John Zorn. Despite its artistic merits, the label collapsed towards the end of the LP era; a licensing agreement resulting in the reissuing of most of the catalog on CD in the mid-‘90s expired, as well. 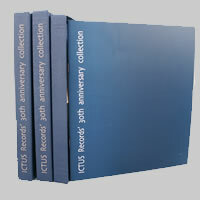 Subsequently, the appearance of the 12-CD Ictus Records’ 30th Anniversary Collection is a major event. Not all of the original albums are included, Indian Tapes, Centazzo’s 1981 three-LP set of richly variegated solo constructions, being conspicuously absent. But, this is well compensated for by a previously unissued ‘84 studio duo session with Lacy, and a slew of tracks from various encounters with musicians ranging from Lester Bowie to Franz Koglmann. Centazzo’s output on this well-appointed box set is so sprawling that to thoroughly digest it, breaking the collection down into groups of CDs is indicated. The three CDs with Lacy are not only representative of the soprano saxophonist’s mid-‘70s work, but also establish a baseline for assessing Centazzo’s drumming. Prior to his calamities, Centazzo had played in pianist Giorgio Gaslini’s quartet; these encounters with Lacy find him transitioning from jazz drummer to improvising percussionist. On Clangs, a ’76 concert recording, Lacy leads with stark themes like “Torments,” keeps a steady course in his uniquely linear improvisations, and occasionally throws a curve with bird calls and squawks from his “pocket synthesizer.” In this set, Centazzo emphasizes color through auxiliary percussion instruments like temple blocks, gongs and bells, adroitly embellishing Lacy’s phrasing and its residual silences. Centazzo’s jazz chops are more in evidence on Trio In Concert, the third party being bassist Kent Carter. In just ten months, Centazzo’s familiarity with Lacy’s music had increased several fold; it is one of several reasons this is one of Lacy’s best records from the ‘70s. By then, Centazzo knew how to swirl around the contours of Lacy’s lines while providing the swing they also require. Centazzo’s orchestral sensibilities remain a potent part of his approach, particularly when Carter’s solos venture into abstract textures. The new album, Tao, is comprised of two duo sessions; one dates from two days before the recording of Clangs, while the other is somewhat anachronistic, as it was recorded in 1984, just prior to the label’s shut-down. On the latter, Lacy’s sound had enlarged, his bead on oft-performed compositions had sharpened, and his rapport with Centazzo was more open than in the ‘70s, making the session a fitting closing chapter to their shared discographies. The rest of the recordings can be roughly divided in two – those made with Americans and those made with Europeans. In 1978, an important wave of American improvisers who no longer had use for obvious jazz and post-serial markers in their music was coalescing, and two Ictus albums contributed to the composite picture of that moment. The Bay finds Rova Saxophone Quartet making their way out of the shadow of Anthony Braxton’s influence. Their attack is feisty, though their utterances are occasionally inconclusive. Episodic compositional structures create ample spaces for improvisation in which they and Centazzo thrive. The tone of the session is largely intensely serious, with the exception of a jaunty Italian march, but even that unravels into incisive improvised music. 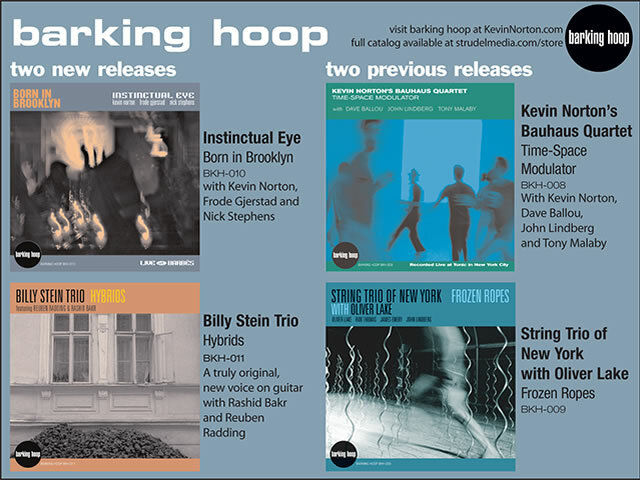 Arguably, The NY Tapes (originally issued on LP as Environment For Sextet) suggests that Chadbourne, Zorn, violinist Polly Bradfield, cellist Tom Cora and trumpeter Toshinori Kondo were further along in developing perceptibly new vernaculars. Even after 28 years, this is bristling stuff, a rush of textures punctuated by rigorously, sparsely detailed spaces. It is baffling why this album isn’t regularly cited as even a minor milestone, because much of the terrain covered this sextet staked out is so often treaded today. Centazzo’s early work with Americans is also represented on additional CDs. The New US Concerts, features the two sterling trios with clarinetist John Carter and saxophonist Vinny Golia that have been previously available on CD, Rebels, Travelers & Improvisers is a compilation including Centazzo’s respective meetings with Bowie and pianist John Fischer. Back To The Future contains tracks made in ’79 and ’80 with violinist La Donna Smith and guitarist Davey Williams. But the latter is most notable for documenting Centazzo’s fine 2005 Tonic gig with pianist Anthony Coleman and guitarist Marco Cappelli, a rare return to improvisation for Centazzo, who now spends most of his time composing and conducting symphonic music. Ultimately, Centazzo is an exponent of European improvised music. The remaining four discs confirms Centazzo to be a peer of the movement’s most lionized musicians. Drops, his ’77 duo with Bailey, is one of the guitarist’s overlooked gems, a set that compares quite well with Bailey’s more celebrated duos with drummers. Much the same can be said of In Real Time in relation to Evan Parker’s recordings of the period. Parker’s ensemble skills are impeccable on this ’77 concert recording, as he deftly blends his raspy saxophones with Alvin Curran’s synth-generated whines and whirrs, and Centazzo’s carefully placed spatters to create a piquant, texture-driven music. Just as he did in his US travels, Centazzo also worked with a wide array of European improvisers at an early stage. A collection of assorted duos and trios, Thirty Years From Monday documents early ‘80s encounters with emergent artists like woodwind player Gianluigi Trovesi and violinist Carlos Zingaro. Centazzo also led the pan-European Mitteleuropa Orchestra; Doctor Faustus, an engaging survey of early ‘80s performances, finds such varied stylists as Enrico Rava and Franz Koglmann in its ranks. For cautious consumers, a single-disc compilation is also available. A mere half-dozen years into the 21st Century , it is already clear that the most profound aesthetic development in improvised music is the rise of the laptop. For all of its potential, however, the laptop is not universally recognized as progress. Creating music on a laptop removes practically all of the physical involvement improvisers traditionally have had with their instruments, and impacts such fundamental issues in improvisation as second-to-second decision making. This is not to say that a laptop improviser cannot vigorously interact with instrumentalists. Phil Durrant’s interactive project with John Butcher and his work with Gail Brand’s Lunge summarize the case that they can. However, because of the laptop’s increasingly central position in music that emphasizes the barely audible – an aesthetic Durrant has helped shape – there is a gathering consensus that this technological development reduces the human factor in improvised music. Subsequently, Thomas Lehn has become an important mediating figure in the dynamic of instrumentalist sensibilities and technology in improvised music. Lehn’s approach to the analogue synthesizer is thoroughly old school. He has a constant, involved physical relationship with the instrument, pressing keys, turning knobs, and patching cables. It is an approach that allows him to turn on a dime to react to his collaborators. This reinforces the sense that Lehn is essentially an instrumentalist. That impression is reinforced by triskaidekaphonia, which finds Lehn triangulating with Frank Gratkowski, who forgoes saxophones and plays only clarinet, bass clarinet and contrabass clarinet, and Melvin Poore, who is heard on tuba and euphonium. The trio zigzags through a lot of rarified terrain. Often, the trio is content to let ample spaces go unfilled and short utterances stand without further comment. Midway through this 2004 performance at Cologne’s Loft, it becomes apparent that there is a deliberate pace for adding details and steam to the proceedings. 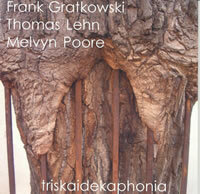 On a few occasions, Gratkowski’s plays stark motives that leap through the registers of his contrabass clarinet. Still, the horns mostly use textures and dynamics to alternately commingle and collide with the synthesizer. The resulting spatters and smears are engaging, but so too are the quieter passages. Among the First World’s experimental music communities, Québec’s Musique Actuelle community is one of the more insular. One might surmise that they are sufficiently supported at home, making travel less the priority it is elsewhere in North America. Certainly, developing a US audience is nowhere near the top of their list, even though most of the New England is within reasonable driving distance from Montreal. Their CDs are not covered by such basic reference books as The Penguin Guide To Jazz On CD. They are busy living and doing their work, the overwhelming bulk of which bears only a passing resemblance to that from other communities. That’s why it is intriguing that these musicians would unabashedly celebrate mid-century American jazz in three concurrently released CDs. Dannie Richmond). What they do better than most, however, is convey the gush of “Peggy’s Blue Spotlight” and the whimsy of “Tijuana Gift Shop,” not as the highs of a mood swing, but as fully realized moments. Guilbeault also milks the sarcasm of “Fables Of Faubus” with anti-Bush lyrics like “you’re so sick and ridiculous” that actually fit the idiosyncratic melody. These facets of Mingus’ music coalesce into a vivid portrait. It may not seem so at first, but Pee Wee Russell is almost as tough to interpret as Mingus, but for a host of different reasons. The arch eccentric of the generation that came of age in the late ‘20s and early ‘30s, the clarinetist committed several endearing heresies late in life, such as playing with Thelonious Monk at Newport, and recording both Monk and Ornette Coleman tunes for Impulse. His playing was rife with odd phrases saturated by a disaffected, wobbly tone, which makes him vulnerable to bad caricature if the swing is sapped from his phrasing to emphasize his idiosyncrasies, or if his quirky intonation is overdone. Robert Marcel Lepage gets it right on Pee Wee Et Moi by sticking with the blues and not delving into Russell’s drink and depression riddled personal life. At his best, Russell’s playing conveyed wizened joy as it unhinges from the quotidian, which Lepage emphasizes throughout this album-length suite. He brings on a half-dozen clarinetists – Guillaume Bourque, Francois Houle, Jean-Sebastien Leblanc, Andre Moisan, Pierre-Emmanuel Poizat and Richard Simas – who hoot and wail with an appealing vigor (unfortunately, there’s no score card to tell them apart). While Guilbeault and drummer Pierre Tanguay simply steam throughout the date, the real wild card is guitarist Rene Lussier, whose off-kilter blues phrases and occasionally maniacal strumming frequently jolt the proceedings. Pee Wee Et Moi is a great wild ride. 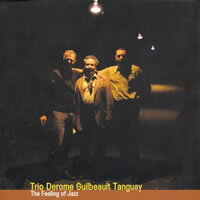 Trio Derome Guilbeault Tanguay is something of a Québecois Clusone Trio. Both groups love jazz enough to be occasionally irreverent with the genre. The comedic roles within the two trios differ: Derome is not as deadpan as Michael Moore; Tanguay’s humor is gentler than Han Bennink’s; and Guilbeault can’t match Ernst Reijseger’s ability to lay the cello across his lap like a guitar. And, their respective tastes bypass bebop, favoring the likes of Ellington, Kern and Porter. When they tap a post-war source on The Feeling Of Jazz, TDGT tend towards the books of cool characters like Lee Konitz and Misha Mengelberg, though they also give Sonny Clark’s “Sonny Crib” a sufficiently gritty reading. TDGT arguably has a tad more punch in their delivery, due to Derome’s harder-edged alto and baritone, the lower reach of Guilbeault’s bass, and Tanguay’s simmering grooves. This is an excellent album, which may pull Trio Derome Guilbeault Tanguay into the international limelight. 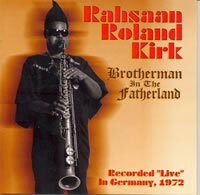 Rahsaan Roland Kirk is at his amazing best on Brotherman In The Fatherland, which documents a 1972 concert recorded in Hamburg. Coltrane was obviously on Kirk’s mind, as he rips through “Like Sonny,” “Afro Blue,” and “Blue Trane;” Trane is also referenced on Kirk’s take on “Lush Life.” Accordingly, Kirk is playing tenor for most of the set; the Santamaria anthem is his only performance on manzello, and he just as sparingly employs his other horns. On tenor, Kirk is simply overpowering, racing through the registers at blinding speed, hitting the blues so hard it makes you scream, and generally doing the impossible. Rahsaan does the impossible not only on a technical level – some of the circular breath-driven deluges will stun even long-time Kirk fans – but on a conceptual one as well, transforming Bread’s banal “Make It With You” into a hard-boiled blues. Some of the tempi Kirk uses approach the insane; pianist Ron Burton, bassist Henry Pearson, drummer Richie Goldberg and percussionist Joe Texidor not only keep pace, but regularly spur Kirk. This is an exhilarating set, a most welcomed addition to Kirk’s discography.